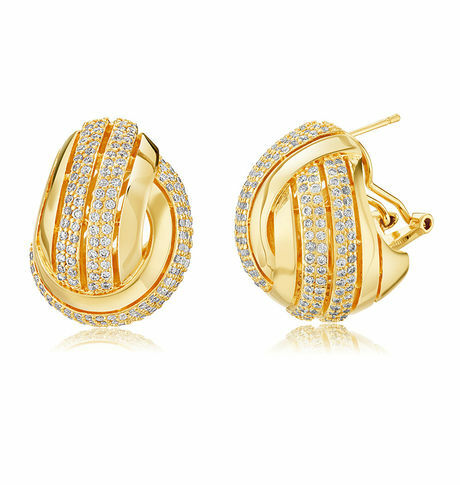 Add glamour to your evening dress with this pair of knotted and sparkling golden earrings. These are elegant piece of classic as well as modern jewellery. Studded with cubic zirconia stones, they will dazzle up your look. Create some fabulous summer memories with these stunning pair of clip-on Gold finish. Add glamour to your evening dress with this pair of knotted and sparkling golden earrings. These are elegant piece of classic as well as modern jewellery. Studded with cubic zirconia stones, they will dazzle up your look. Create some fabulous summer memories with these stunning pair of clip-on Gold finish.Cancellation and Return Policy: • Exchange allowed post booking • No order cancellation or Refund transaction allowed at the store.